Larson Electronics LLC, the industrial lighting expert, has released a new explosion proof white LED spotlight for forklifts, that produces 2,250 lumens of bright white illumination. This spotlight can be used as a headlight for forklift drivers to clearly see in lowly lit environments. This fixture is NEMA 3, 4, 4X, 7 and 9 rated, designed to withstand demanding environmental and operational conditions in hazardous such as warehouses and delivery bays. 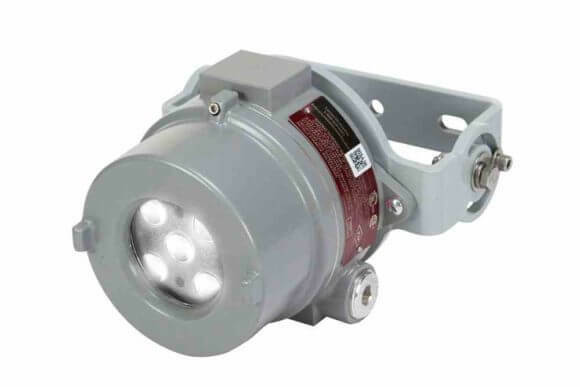 The EXHL-TRN-LE4-FKWL-WHT-1224 from Larson Electronics is a Class 1 Division 1 & 2, Class 2 Division 1 & 2, and Class 3 Division 1 &2, explosion proof LED spotlight for illuminating forklift pathways during operation in low lighting. This LED spotlight contains five 5-watt LED bulbs that produce a total of 2,250 lumens of white light, while only drawing 25 watts. The spotlight beam has a 5º spread, providing operators with a high intensity center beam visible during both day and nighttime operations. This light acts as both forward area illumination and a visual path indicator of the forklift for pedestrian safety. The EXHL-TRN-LE4-FKWL-WHT-1224 is listed for worldwide use and is NEMA Type 3, 4, 4X, 7 (B,C,D) and 9 (E,F,G) rated for use in harsh conditions. This unit operates within temperatures of -40° C to 60° C, is waterproof to 3 meters and resistant to dust, dirt and humidity buildup. The housing is constructed of copper free aluminum, and the LED is sealed behind a borosilicate glass lens. This forklift spotlight operates on universal 9-60V DC, including common 12, 24 and 48 V DC voltages. The unit is mounted with an adjustable surface mount bracket with adjustable tilt and rotation. Wiring is completed with terminal strips located inside the fixture. Larson Electronics LLC: Larson Electronics LLC is a manufacturer of industrial lighting equipment and accessories. The company offers an extensive catalog of industry-grade lighting and power distribution products for the following sectors: manufacturing, construction, food processing, oil and gas, military, marine and automobile. Customers can benefit from the company’s hands-on, customized approach to lighting solutions. Larson Electronics provides expedited service for quotes, customer support and shipments.